Press Release:- A new chapter of cooperation has commenced between Guadeloupe and the Organisation of Eastern Caribbean States promising to open up new social, cultural and economic opportunities for citizens across the growing regional grouping of independent and non-independent countries. With the recent accession of the French Territory to the OECS, inter-regional ties are being strengthened across the health, education, tourism, transport, agriculture, transport, culture and trade sectors. OECS Director General Dr. Didacus Jules in his opening remarks to distinguished delegates and guests at the Accession Ceremony in Basse-Terre, said for Guadeloupe this accession actualizes its deep desire for recognition and acceptance of its Caribbean identity and for cultural, economic, social and other connection with the rest of the region. Dr. Jules said the convening of this Special Meeting of the Authority signifies the importance which the OECS Heads of Government place on the acceptance of Guadeloupe into the Organisation. “For Guadeloupe in its political persona as France, as Europe in the Caribbean, it is an expression of the EU policy of allowing, even encouraging outermost regions to integrate with their immediate neighbours: the so-called “Neighbourhood Policy”. “In the long arc of human history, the narrative of Our Caribbean Civilization has been a relatively short but intensely combative tale of contending forces. “Today both history and geography have conspired to bring us to this moment in which the contradictions of our history have finally been overcome by the undeniability of our geography. “Today – five years following the accession of Martinique – we welcome our sister Guadeloupe to Associate Member status in the Organisation of Eastern Caribbean States. “This brings to twelve the membership of our organization: six independent Anglophone territories and six non-independent territories (three of which are British Overseas Territories and three French Departements). “The argument of Sir Arthur Lewis of the need to overcome the agony of the Little Eight has been superseded by the unparalleled possibility of the archipelagic twelve” said Dr. Jules. The Director General noted the immense opportunities ahead for cooperation in areas of integrated tourism, air and sea transport, health, environmental and disaster management, agricultural development and technology transfer, trade and investment, sports, culture and education reform with a focus on technical and vocational education and training as but some functional areas. 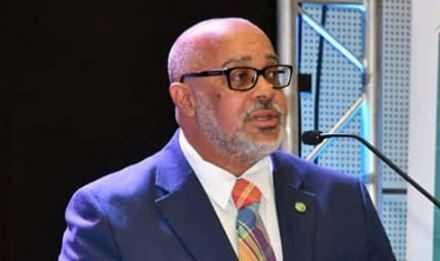 The Director General went on to add that with any relationship, the value that is to be derived from Guadeloupe’s associate membership of the OECS will depend on the amount of work that is put into making the relationship work. “Today is only the beginning of something in whose ultimate possibilities we can only discern a truly ascendant Caribbean civilization” concluded Dr. Jules.